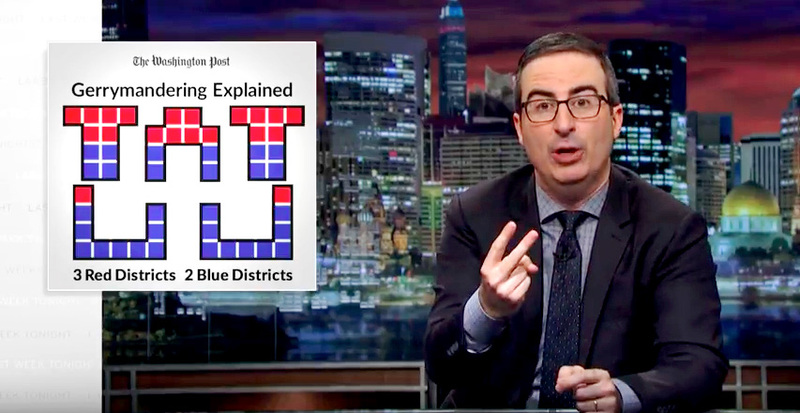 On HBO’s “Last Week Tonight,” John Oliver tackled an issue that many consider the most pressing threat to our democracy: gerrymandering. As he often does, Oliver explained the intricacies of this complex policy issue with wit and humor, much to the alarm of voters everywhere. After explaining how politicians help their own party win seats by “packing and cracking” voters into districts, Oliver left viewers with a glimmer of hope by introducing the idea of independent redistricting commissions. These commissions, he says, wouldn’t solve all our problems but would take self-interested politicians out of the process. The most important part of the segment came, however, when Oliver acknowledged that the root of the problem is not the folks who draw the lines, but basic demographic shifts that have been happening for quite some time. Oliver and Levitt are right. As convenient as it is to blame politicians, the vast majority of the “packing” is actually being done by like-minded voters who are increasingly choosing to live in crowded urban areas. The result is distorted election outcomes and a dwindling number of competitive districts (less than 15% of U.S. House seats), not to mention the polarization that has crippled Congress. This isn’t to say that independent commissions aren’t needed. They are absolutely necessary to instill trust in the process and foster partisan fairness. But, as Oliver suggests, they won’t solve the underlying problem. So… what will? To understand the solution, let’s go back to Oliver’s explanation of the problem. To show voters how mapmakers manipulate lines, he uses a popular graphic from the Washington post (shown below) to depict a state that is 60% blue voters and 40% red voters. The problems begin when we’re tasked with carving the state up into five districts which each elect one legislator. As Oliver shows, despite a convincing majority that prefer blue we can come up with lines that allow 3 red winners and 2 blue winners, or as many as 5 blue winners and 0 red winners. Both scenarios would be the product of gerrymandering, and neither of them are fair. However, there is also a glaring problem with the scenario in which we achieve “perfect representation” of both parties: none of the five districts are remotely competitive. In real life, independent commissions can strive for competition, but geographic realities often force them to sacrifice one value (competition) to ensure another (fair partisan outcomes). As Oliver puts it, “There is no one right way to draw a district. Reasonable people will disagree. Some might prioritize a district being politically competitive. Others might favor compactness. Others want to keep so called communities of interest together…” The reality is that as long as we are working within the confines of single-winner districts, we’ll always be sacrificing one value for another. Here is how it would work: The 24 states electing five or fewer House members wouldn’t draw any districts at all and would elect their representatives at-large. Larger states would employ independent commissions to draw bigger districts that would elect between three and five representatives, rather than just one. Instead of choosing just one candidate on Election Day voters would use ranked choice voting, which gives them the freedom to rank candidates in order of choice. Ranked choice voting ensures as many voters as possible help elect someone, and eliminates the “spoiler effect” which often leaves voters feeling pressure to vote for one of the two major party candidates. A majority of voters would always elect a majority of seats in a state or district, while like-minded voters in the minority could elect their fair share too. This might sound unorthodox, but it is a real option that is about to be introduced as a bill in the House of Representatives this summer. It is the only solution put forth that would actually make who draws the lines irrelevant and ensure fair results and competition everywhere. For instance, look at two states—Connecticut and Oklahoma—that (unfairly) shut out voters of the minority party from being represented at all. With fair representation voting, each party would be fairly represented, each state would have vigorous competition for the swing seat that is up for grabs, and voters would finally be able to elect ideological diversity within the parties (an Oklahoma Democrat and a Connecticut Republican) to Congress. Not only would this ensure fairer results, but shared representation among the parties within a state or district would create new incentives for effective collaboration rather than partisan gridlock. John Oliver is right: gerrymandering is hindering our democracy and it is imperative that we do something about it. It’s time to think outside the box and fight for a comprehensive solution that addresses the root of the problem. Only then will election results be, as Oliver put it, the product of our own crazy decisions rather than our politicians’ crazy lines.